BOSTON – Data from valuation reports and other financial documents suggest that suspect actuarial practices may have helped misstate the real costs of MBTA Retirement Fund (MBTARF) pensions, compounding to an estimated $200 million of underfunding over a period of 25 years from administrative expenses alone, according to a new study by Pioneer Institute. Download "Forensic Mysteries from the MBTA Retirement Fund’s Actuarial Reports"
An actuarial valuation is intended to provide a reasonable approximation of the normal cost of pension benefits being earned, size up the long-term liabilities associated with the plan and determine the annual required contribution (ARC), the money going into the fund to ensure pensions can be paid to its members when they retire. Pension plans sometimes face pressure to understate liabilities to create a more positive financial picture and reduce employers’ required contributions. Pioneer’s analysis of hundreds of pages of financial reports revealed a slew of tactics that could have made the MBTARF’s financial picture appear artificially rosy. These financial sleights of hand included obviously wrong assumptions about administrative costs; using dated and/or inappropriate mortality tables; and increasing the assumed rate of return (ARR) on investments at a time when other public pensions were doing the opposite. A rosy view of the MBTARF’s financial condition enabled the MBTA to offer its employees pension enhancements in lieu of pay raises, thereby putting even more pressure on fund finances. Nevertheless, Buck Consultants, the fund’s actuary, somehow found that the “normal cost” of covering MBTARF pension benefits fell from more than 12 percent of covered payroll in 1991 to less than 9 percent in 2014. For at least a quarter-century, the MBTARF assumed administrative expenses of 0.45 percent of covered payroll. Actual administrative costs were at least two times higher in all but one year since the early 1990s. Yet, Buck Consultants repeatedly deemed the assumption “reasonable” – even when the actual administrative expenses jumped to six times the assumed rate. Over 25 years, low-balling administrative cost assumptions alone compounded to an estimated $200 million of the fund’s $815 million unfunded liability at the end of 2014. The valuation data do not show Buck recommending that the assumption be adjusted upward until 2016. Over the years, dated mortality tables were frequently used to calculate pension costs and liabilities. Even when the longevity assumptions were updated, it was often not to the latest standards recommended by professional organizations. The use of more current mortality tables would have likely produced a higher ARC, since they tend to include better life expectancies in retirement. MBTARF valuation data indicate that gender-appropriate mortality tables were not used until 2010. Instead, male tables were applied for all active members, even though women accounted for 20 percent of plan membership as early as 1991. The use of male-only mortality tables may have artificially suppressed pension costs, since men tend to have a shorter life expectancy than women. Even when mortality tables were finally updated, the MBTARF twice offset the possible liability increases, and potentially a higher ARC, by raising the fund’s assumed rate of return on investments. The retirement board also fiddled regularly with its methods of booking investment gains and losses. Despite that annual contributions more than tripled from 2000 to 2014, the unfunded liability continued to rise, increasing tenfold from $82 million to $816 million in the decade through 2014. Annual contributions to the fund have been far less than the amount of benefits paid since at least 2001. The MBTA, which is largely taxpayer-funded, is obliged to cover three quarters of any pension underfunding. Dr. Atanasov recommends that the fund be placed under the oversight of the Public Employee Retirement Administration Commission (PERAC), which regulates all other Massachusetts public pension systems. He further calls for PERAC to be made the statutory auditor of the MBTARF, as it is for Massachusetts state employees’ and teachers’ pensions. 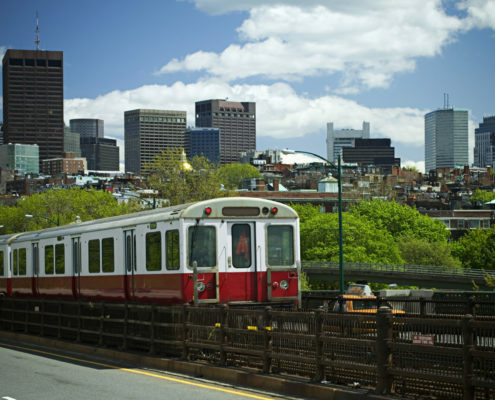 The study is based on annual MBTARF actuarial valuations from 1991 through 2014, all of which were conducted by Buck Consultants, as well as MBTA financials. About the Author: Iliya Atanasov is Pioneer’s former Senior Fellow on Finance, who spearheaded research on pension management, budget analysis, infrastruc­ture and municipal performance. Iliya received his PhD in Political Science from Rice University, where he was a Pres­idential Fellow. He also holds BAs in Business Administra­tion, Economics and Political Science/International Relations from the American University in Bulgaria. Pioneer Institute is unveiling “MBTAanalysis.com,” a web-based data tool that provides year-by-year comparative data and performance ratings for the MBTA and other transit agencies across the country.